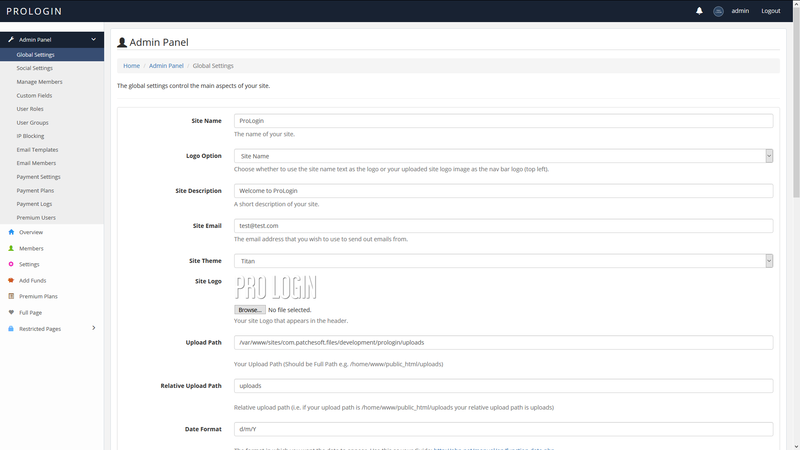 Pro Login – Advanced Secure PHP User Management System is a powerful PHP script that offers a secure user management system. 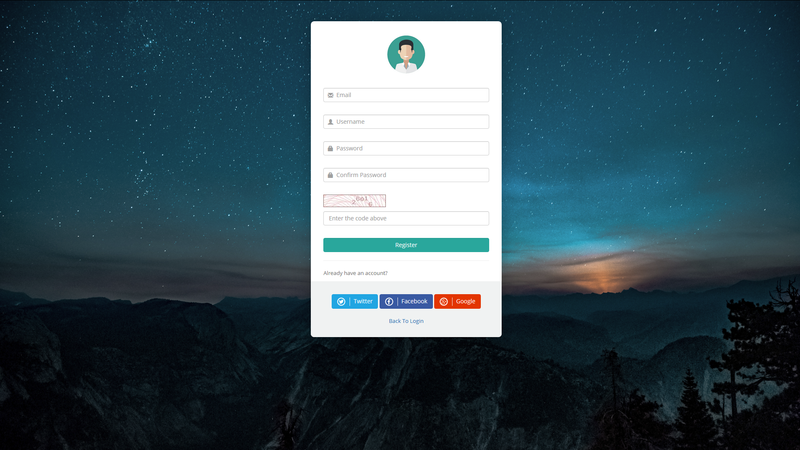 The application is a great way to build your website, allowing your users to register an account and build restricted access to certain users. We offer great support and it’s very easy to install. It’s powered by MYSQL and PHP with CodeIgniter 3.1, making it a very robust solution. Patch and fix any bugs or broken content. Want us to help setup the software for you and get it running? Check out our Services page for more details. Pro Login is also very secure! Built using the latest CodeIgniter Framework Version 3.1 that has been tried and tested by millions of developers. Passwords are encrypted using PHPass Library, standard bcrypt encryption. Captcha enabled pages to prevent spam! Captcha enabled registration page to prevent bots from spamming your site (can be disabled in Admin Panel) Includes optional Google ReCaptcha. Users can also register accounts using their Social Network accounts, making it even quicker to sign up to your site! Prevents spam by making sure the email address is unique and valid. Passwords are encrypted using PHPass library to make sure your data is safe! Can disable registration from Admin Panel, as well as Social Login option. User Profiles that allow users to comment on each other. Frontpage shows a list of the newest users registered. Graph displays members that have registered in the last six months. Breakdown shows how many users signed up via Google, Twitter and Facebook. See users who are currently online, users who have registered today and total user count. All of this is cached too so it saves resources on your server! Member List displays all registered users. User Settings area allows user to change their avatar, update their name and other information. Change Password option in Settings page too. 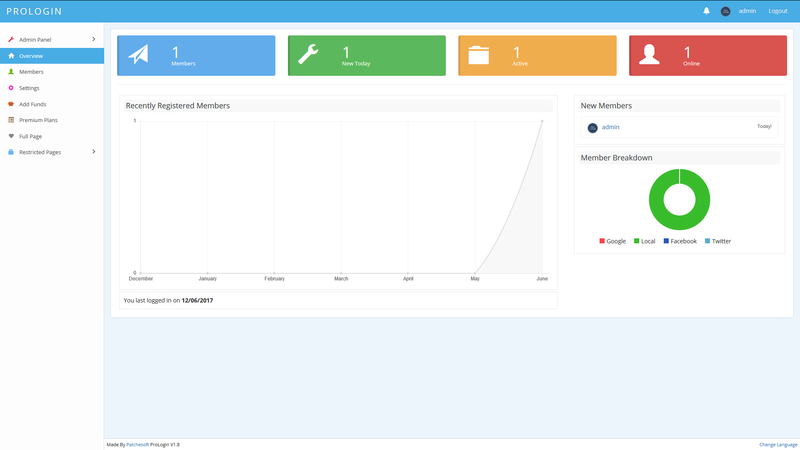 User Role System allows you to make members have limited access to various areas of the site. Custom Fields system allows you to add extra fields to registration form. Change site name, logo and other settings. 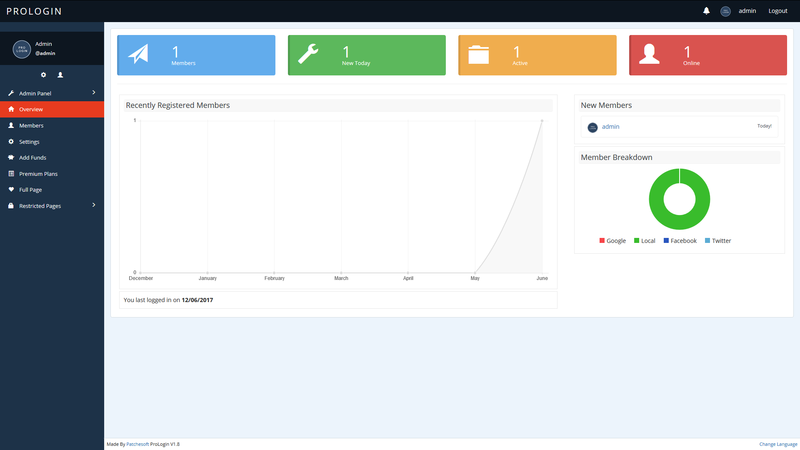 Manage Members allows you to edit, delete and view Member information, such as their IP address, email and when they last logged in. 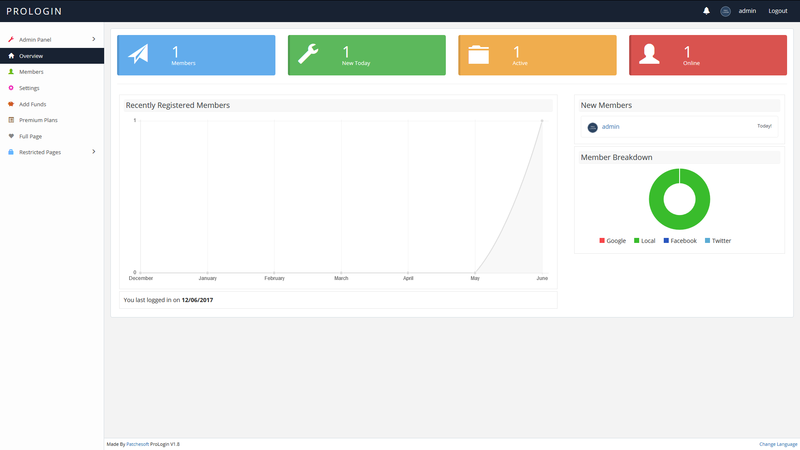 User Groups allow you to sort and categorize members easily. Email Templates make translating emails much more easier by using our Email Templates option. Email Members area allows you to send emails to all of your registered emails. Select by User Group, Username or All Users. IP Blocking system allows you to block certain IPs from registering accounts and from logging in. Setup Payment Plans, Payment Settings and view Payment Logs for new Micro-Transaction feature. Turn on or off the ability for users to purchase credits for their accounts. Check out via PayPal, supports multiple currencies. Credits automatically added to user accounts after payment has been made. 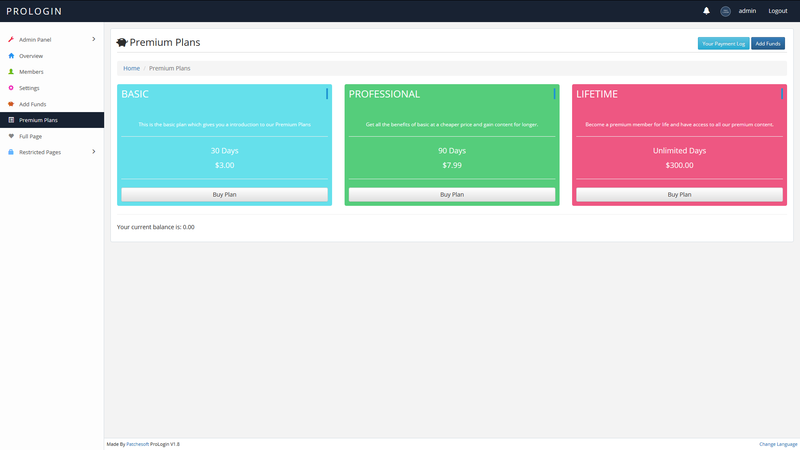 Users can purchase plans that add Premium time to their account. Plans can be added via the Admin Panel, select price and how many days the plan adds. Added in sample page to show how to restrict user to Premium only pages. Allow users to switch between a language of their choice using our unique Language Switcher. Requires PHP 5.4 and a MySQL database. Supports MySQL, Mysqli and PDO drivers. Added new Welcome Email for newly registered members. Added dropdown menu when you click on your avatar in top nav bar. 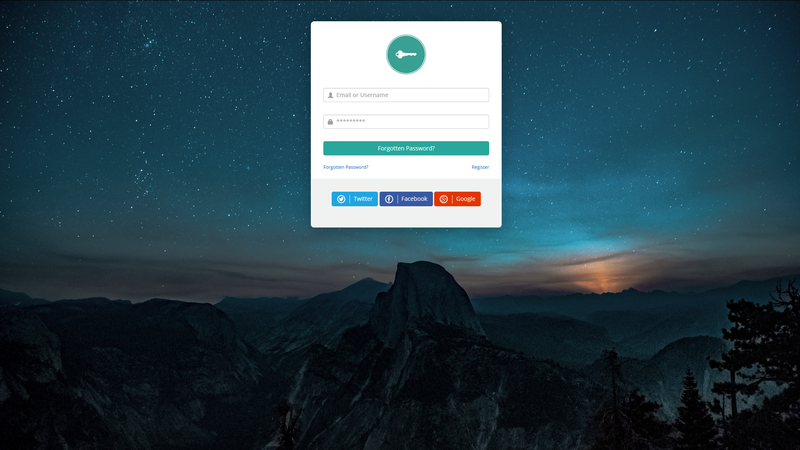 Completely redesigned Login/Register pages, with AJAX error checking. Added two new layouts + updated older ones. Option for users to enter their social media information in settings. Implemented notifications system; get notifications when someone comments on your profile. 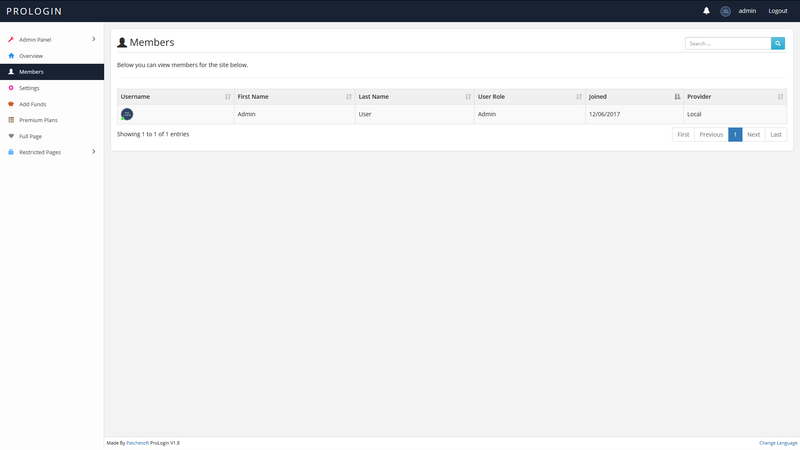 Brand new setup file which automatically writes the configuration files, setups database and creates admin account for quick setup. Implemented new Datatables for looking up Members. Allows faster searching + AJAX viewing. Implemented new method for redirecting to a custom url after logging in. Added in Color Picker for when picking Payment Plans theme. Implemented User Avatar Displays to show user’s avatar + whether they are online/offline. Implemented new Custom Fields option. Add custom fields to Registration, User Settings, Profile. Option to turn off Secure Login to allow users to stay logged in on multiple devices. Removed User Avatar size restrictions. 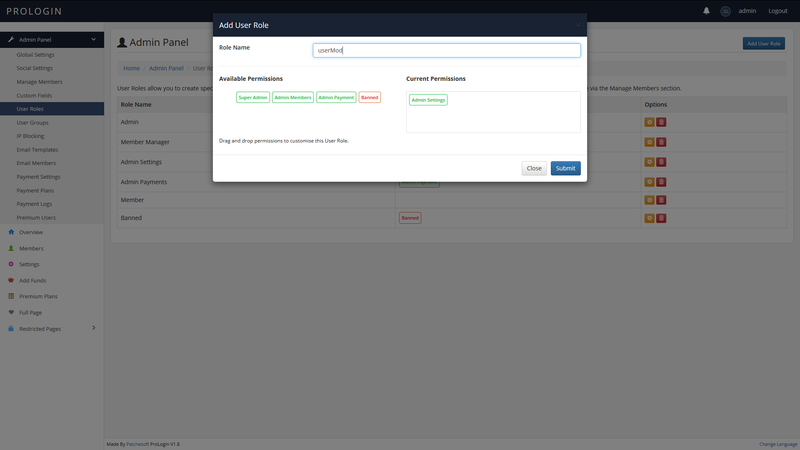 Set default User Role in Admin Panel. Removed old Member User Level (replaced with User Role). Removed Banned User Level (replaced with User Role). Fixed bug when paginating through User Groups Member List. Implemented new User Roles system (replaces are User Level). 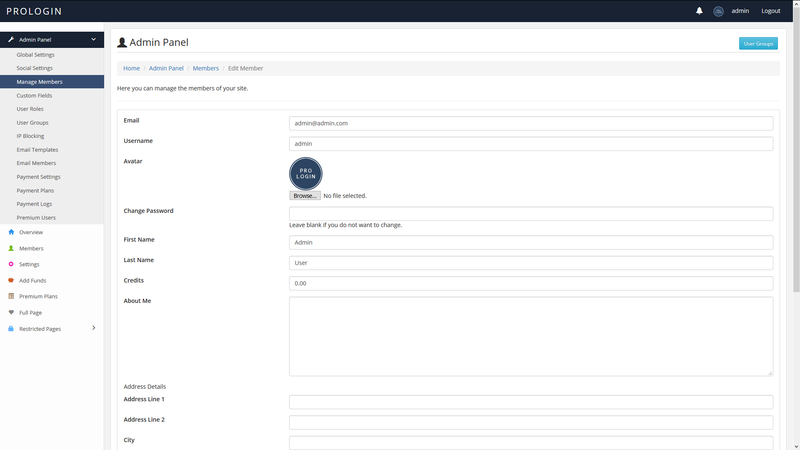 Add User Roles which have access to various parts of the site. Super Admin, Admin Members (manage members, cannot add/edit admin members), Admin Payment (manage payment options/logs), Admin Settings (manage global and social media settings). Implemented Payment Plans page where user’s can select a plan to increase their Premium Time.